That is a gorgeous photo! The water is the most gorgeous shade of blue! A beautiful day on the Nocturne! You’re a very good boat cat with that watching of the sail trim. 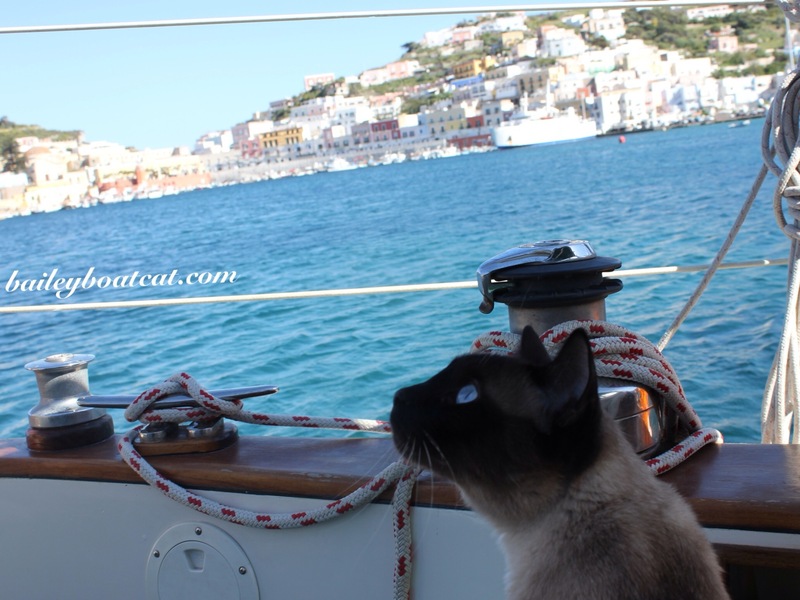 Cats and sail – two of my favourite things! Cats ON boats I approve of, but cats AS boats I don’t trust. Flippem, and you’re fishfood. I concur wif Zest of Little Rock: Le **sigh**…dat shure iz da life Bailey!!! Oh what a beautiful coastline. Ahhhh…you live the life! And I would never tire of looking into your baby blues!! What a beautiful coastline! Ahhh…the life you lead. And I would never tire of looking into your baby blues! Is it a bird? Is it a plane? Is it your Dad getting ready to hand you a treat?? ?